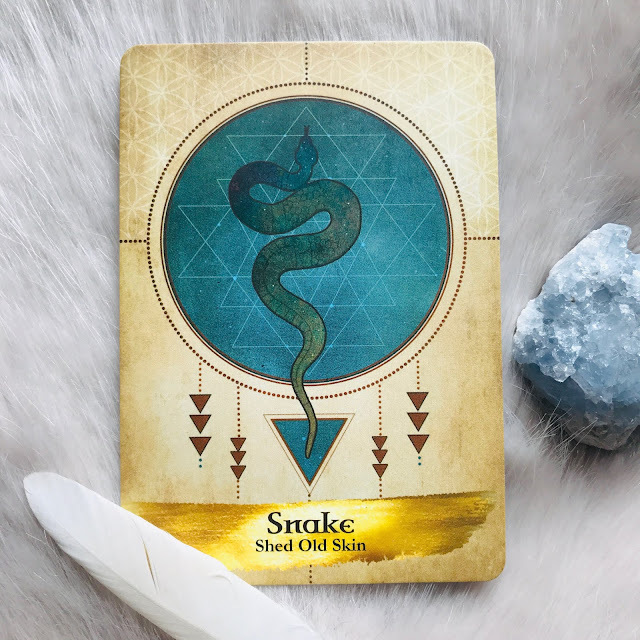 The theme for the last few days has been about trusting that things will happen in their own time, and today Snake tells us what we can expect if we do. Snakes are symbolic of renewal - casting off the old and revealing something new and beautiful underneath. If you've ever seen a snake shedding skin you'll know it isn't always easy (or pretty! ), but they are experts at leaving behind what they no longer need. What do you need to shed? Are you wearing a 'skin' that no longer feels comfortable, or that no longer lets your gifts and talents shine through? Maybe it's time for some physical changes, or maybe it's mental attitudes or outdated beliefs that are limiting you. If so, it's time to let go! If you are on a spiritual path, this card can indicate a period of expanded consciousness. When Kundalini energy (symbolised by the serpent) rises up through the seven main chakras, a higher level of spiritual connection and expansion of consciousness is possible. This is a card of hope and renewal. How exciting! The content here is provided freely. If you enjoy what I do, you might consider using my Amazon affiliate links when you're placing an order, or you can buy me a cuppa by clicking on the link below. © The Curious Cardslinger. Design by Fearne.